Book review: A Threat of the First Magnitude, FBI Counterintelligence & Infiltration from the Communist Party to the Revolutionary Union 1962-1974 | Fight Back! Richard Aoki. Morris Childs. D.H. (Don) Wright. Darrell Grover. Betty and Larry Goff. The “Ad-Hoc Committee for a Marxist-Leninist Party.” Carl Freyman. Herbert K. Stallings. John McCaffrey. Who are they and what do they have in common? They are the subjects of an important new book, A Threat of the First Magnitude: FBI Counterintelligence & Infiltration from the Communist Party to the Revolutionary Union 1962-1974 by Aaron Leonard and Conor Gallagher. They were also all FBI handlers or their informants who infiltrated the Revolutionary Union (RU), the Communist Party (CPUSA), and other groups in the U.S. communist movement. Most people - even left-wing activists - don’t know most of these names. With A Threat of the First Magnitude, Leonard and Gallagher have done an important service in teaching us about who these people are and the methods the FBI used to infiltrate the Revolutionary Union - the largest Marxist-Leninist organization to emerge from the radical movements of the 1960s - as well as other revolutionary organizations of that period and the CPUSA before them. It is incumbent on serious leftist activists to understand as much as possible about how the government has attacked political movements in the past, because there is no reason to believe those efforts have stopped. On the contrary, in today’s post-911 national security environment and social media-saturated world it seems logical to assume that government surveillance and operations against dissenting individuals and organizations are probably greater than ever. In fact we don’t just have to guess about that; there is plenty of recent experience with informants in left-wing movements. One of the most important recent experiences on the left is an infiltrator who went by the name of “Karen Sullivan” who joined the Anti-War Committee and Freedom Road Socialist Organization (FRSO) in Minnesota to spy on them as they helped organize protests against the 2008 Republican National Convention (RNC). After the RNC protests were over, “Sullivan” then stayed on for a couple more years to continue spying, lying, and secretly trying to build a case against the groups. This led directly to coordinated FBI raids on several activists’ homes in Chicago and Minneapolis on September 24, 2010, as well as 23 activists receiving grand jury subpoenas in a witch hunt against international solidarity activists. So we know the FBI still uses informants to infiltrate and attempt to repress leftist movements and organizations. This is not just an obscure curiosity only of interest to ivory tower historians. Drawing largely on internal FBI documents - many heavily redacted - that book’s authors have struggled to get access to via the Freedom of Information Act (FOIA), the book does a thorough examination of several FBI informants in the communist movement. And importantly for a deeper understanding of what was really going on, the book also goes into some detail about the informants’ FBI handlers, particularly focusing in on the FBI Chicago field office and in particular on the role of FBI agents Carl Freyman and Herbert K. Stallings. It would seem that the Chicago FBI office was the most successful in its development of informants who rose to the top leadership levels of the Communist Party and the Revolutionary Union, and in even creating an entire fabricated shadowy factional organization working inside the Communist Party - the Ad Hoc Committee for a Marxist-Leninist Party. But Chicago was by no means the only FBI office handling informants in the RU and other groups; the book makes clear that the FBI attempted to place informants in the Revolutionary Union throughout the country. The Chicago office did, though, handle prized informants in the CPUSA and RU. It is notable that the FBI’s top informant in the RU, Don Wright, advocated moving the group’s headquarters from the Bay Area to Chicago - which the group in fact did - conveniently moving them to the home turf of the most sophisticated FBI office in infiltrating the communist movement. The spotlight that A Threat of the First Magnitude shines on the key role of informants in U.S. government repression against the left is important. 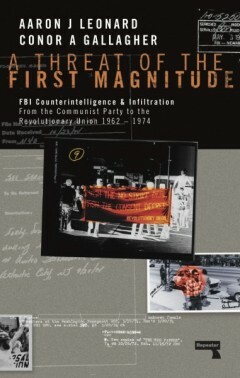 The book demonstrates the crucial role that informants have played for the FBI in gathering information that would be hard for them to acquire by other methods due to the precautions that Marxist-Leninist organizations usually take precisely to prevent the kinds of disruption the FBI was intent on carrying out. Informants working inside an organization not only give the government entities access to internal matters of an organization that aren’t visible to the public, but they also give them the opportunity to spread lies and confusion, cast aspersions on legitimate members, cause and exacerbate tensions and conflicts, and even to encourage people to engage in foolish activities. The information that infiltrators gather directly aids the state in carrying out more severe repression when they decide to drop the hammer. The book makes the case that the FBI saw their informants in communist organizations as their most sensitive and important operations, so they fiercely guarded the identities of their infiltrators and the operations they were part of. Some informants in the RU went public and testified against the group, such as Betty and Larry Goff, who testified to a congressional committee about the RU in 1971. But for the most part the FBI seems to have managed to conceal the identity of their key informants and operations, even from the watershed Church Committee hearings on government intelligence overreach in 1975. So today, more than 50 years after many of the events covered in this book took place, relatively little is still known about the FBI informants and the operations they carried out. In fact, many leftists and historians still haven’t concluded that all of the people talked about in A Threat of the First Magnitude even were in fact FBI informants. The book intends to make the case that they were, based on a close study of internal documents they’ve been able to pry out of the FBI, while exploring the damage these particular informants did. A Threat of the First Magnitude is a sequel to the authors’ 2015 book, Heavy Radicals: The FBI's Secret War on America's Maoists, the Revolutionary Union / Revolutionary Communist Party 1968-1980. That book attempted to fill a hole in the histories that have been published thus far about the New Communist Movement in the 1970s, most of which understate the importance of the RU and also understate the role of state repression against the group and the broader movement they were part of. In their research for Heavy Radicals, the authors requested many FBI files via the Freedom of Information Act (FOIA). But the FBI is notoriously stingy with what it releases, and they often release documents at a glacial pace and usually only after much back and forth. When the FBI finally does release documents, they are often heavily redacted. Heavy Radicals included information gleaned from some of the first FBI documents Leonard and Gallagher received. But after the book was published, they continued to receive more FBI files that shed light not only on the RU and the groups they interacted with, but groups that preceded them as well. Drawing on those documents, A Threat of First Magnitude goes deeper on the FBI’s operations against the CPUSA and Progressive Labor Party (which preceded the RU), and the direct links between those operations that morphed into operations against the RU as they emerged and grew. The Ad-Hoc Committee for a Marxist-Leninist Party or the FBI’s committee to promote division in the communist movement? A major contribution of the book is its examination of the Ad Hoc Committee for a Marxist-Leninist Party. This was a secret grouping within the CPUSA that ostensibly argued for the pro-Soviet CPUSA to instead adopt a pro-China, anti-revisionist line in the context of the Sino-Soviet split. The Ad-Hoc Committee’s only public presence was the appearance of a newsletter from time to time, which the FBI made a point of surreptitiously mailing to CPUSA leaders around the country to maximize suspicion and confusion. According to documents cited in the book, mail sent to the PO Box listed on the Ad-Hoc Committee’s newsletter ended up in the hands of the FBI, who then contemplated opening up investigations against the people who wrote to the group. Leonard and Gallagher uncover enough evidence to conclude that that the Ad Hoc Committee was an FBI creation in its entirety. While they may have recruited some sincere communists along the way, the group was controlled by the FBI, which used it for its own disruptive purposes. This is something that more than a few people have suspected or thought might be the case. But A Threat of the First Magnitude has assembled enough evidence to make the case convincingly. FBI memos cited in the book discuss ways the Ad-Hoc Committee should respond to world events. The FBI responds happily to reports of the CPUSA expelling members they thought might have been involved in the Ad-Hoc Committee. The FBI also used the Ad-Hoc Committee as a cover to spin people off to infiltrate other groups, who would then use the Ad-Hoc Committee to establish a credible reference of a revolutionary group they were involved in before. This is exactly what Don Wright did when he joined the RU, for example, to build credibility with RU leader Leibel Bergman, a former long-time CPUSA member. This is one of the several links the book explores that directly connect FBI repression against the CPUSA to later efforts against the RU. While FBI repression against the Black liberation movement and American Indian movement of the 1960s and 70s is fairly well known on the left, the much longer-running and larger-scale FBI operations against the CPUSA over the course of several decades during the 20th century is probably less understood among activists today. A Threat of the First Magnitude explores one of the most important of those FBI operations against the CPUSA, which had an informant at its heart - Morris Childs. A CPUSA member since the 1920s, by the mid-1930s Childs was a member of the Party’s highest body, its Central Committee. In the 1940s in the aftermath of his mentor Earl Browder being expelled from the CPUSA for liquidating the party organizationally and politically, and while Childs was dealing with serious health problems, the FBI approached him and he agreed to become an informant against the CPUSA in exchange for the FBI paying for top-notch medical care for his health problems. For years he passed along information on the party to the FBI. Even more damaging, while an informant, Childs had international responsibilities. In this capacity he was on a first-name basis with - and passed on intelligence about - top leaders of the Soviet Union including Khrushchev, Brezhnev, Andropov, and other central figures. So as the split between the Soviet Union and China was unfolding, the FBI had an inside guy in the CPUSA with access to top Soviet leaders. He had access to information and documents that were very difficult to get, not to mention invaluable intelligence on how the top leaders of the USSR were thinking and acting. This information was so valuable that they mostly stopped having Childs do other informant work, just focusing on this international goldmine he was handing them. A Threat of the First Magnitude pieces together various FBI reports to conclude that the RU was infiltrated from the very beginning, even before it went public as an organization. The book concludes that one early FBI informant in the RU was Darrell Grover. Grover was in charge of political education in his city, and by 1969 was the RU’s treasurer and on its executive committee. He appears to have played an important role in the RU’s early decision about whether to publicly criticize the Progressive Labor Party (PL). PL was the first pro-China Marxist-Leninist group in the U.S. which had been formed by former CPUSA members who left over the CPUSA’s growing reformism. While initially promising, by 1969 PL was becoming more critical of revolutionary China, of the Vietnamese liberation movement and of the Black liberation movement in the U.S. This alienated them from many young revolutionaries at the time. In the RU’s internal debate about whether to go on the attack against PL for these erroneous positions or not, FBI informant Darrell Grover apparently personally convinced some of the most important skeptical leaders in the RU that they should publicly attack PL. And so it was; the RU’s first publication, Red Papers 1, includes a lengthy polemic against PL. Politically, the substance of the RU’s critique of PL is on point and provided much-needed clarity in the movement about what was wrong with PL’s politics and why young revolutionaries needed to build something new. Even so, the FBI was nonetheless pleased with the public display of disunity among Marxist-Leninist forces and quickly jumped into action, making sure to send the publication to all addresses they had for PL to maximize the impact. The information that Leonard and Gallagher compile compels a reexamination of some other key moments in U.S. left history in the 1960s and 70s as well, to incorporate a deeper understanding of how the FBI, principally via its informants infiltrated in communist groups, intentionally and strategically derailed left movements at critical junctures. A key example is the book's treatment of the National Liaison Committee (NLC). The NLC was an ambitious but failed effort in 1973 to form a new, multinational revolutionary communist party out of the upsurge of the 1960s by uniting the Revolutionary Union with several new communist organizations rooted in oppressed nationality communities: the Puerto Rican Revolutionary Workers Organization (PRRWO), the Black Workers Congress (BWC), and I Wor Kuen (IWK). The failure of this unity effort mirrors many failed attempts at multiracial/multinational unity on the left throughout U.S. history, so in one sense its failure could be seen as yet one more example of the ongoing political difficulty of building multiracial/multinational unity on the left in the context of a society rooted in national oppression and wracked with white chauvinism. Such failures have often been chalked up to shortsightedness or ego or personality quirks on the part of specific leaders, or chalked up to white chauvinism or otherwise bad political lines that made unity difficult. Those are important factors in analyzing the failure of the National Liaison Committee to unite several formidable organizations to form a new united party out of the upsurge of the 1960s and early 70s. But A Threat of the First Magnitude makes a strong case that the intentional effort of a well-placed FBI informant to wreck things played a larger role than people realized at the time in derailing unity between these organizations. Specifically, the book establishes beyond a reasonable doubt that Don Wright was an FBI informant while he served as one of the four members of the RU’s top leadership body and as the RU’s representative on the National Liaison Committee that was supposed to be working to unite the RU with these other organizations to form a party. It’s hard to see it as just a coincidence that in a process intended to build unity, Wright did the opposite: his actions created extreme confusion, disruption and disunity - not only within the RU and between the RU and the other organizations, but also even reaching inside the other organizations to stir up those groups’ internal conflicts. The book explores Wright’s role and the FBI’s role generally in exacerbating conflicts within the PRRWO, whose leader Wright actually got married to during this process (! ), as that group shrunk and internal conflicts in the PRRWO turned increasingly sharp and even violent. The book also explores the conflicts that developed within the Black Workers Congress and the intense FBI campaign against BWC leader James Foreman, who ended up being expelled from the BWC in 1973 in the midst of the National Liaison Committee process. On that note, A Threat of the First Magnitude examines the FBI’s ongoing intensive efforts to discredit and neutralize important legitimate leaders like the BWC’s Foreman and RU’s Leibel Bergman, both of whom have incredibly large FBI files which mostly have still not been released. While both of them were aware of the FBI’s campaign against them, they almost certainly weren’t aware of the scope, and particularly could not have been aware of the depth of infiltration by FBI informants in their projects and the damage those informants helped cause. Richard Aoki - Samurai among Panthers, or FBI informant among revolutionaries? A Threat of the First Magnitude has a very interesting chapter on Richard Aoki. While Richard Aoki was not part of the RU or CPUSA, he was a key figure on the left in the Bay Area at the time when the RU emerged there, and he interacted with them. As it turns out, many released FBI documents now show that he informed on them as well as many other left organizations in his reports to the FBI over decades. Aoki, who committed suicide in 2009, was best known for being a Japanese-American who was a ‘secret member’ of the Black Panther Party who helped them get their first guns. He was also a top leader in the student strikes at UC-Berkeley to establish ethnic studies programs there. Before his involvement with the BPP, Aoki had been a member of the Socialist Workers Party (SWP), and after his time with the Black Panthers he related to many different groups. Aoki, when he died, was generally held in high esteem on the left. But soon after, the Richard Aoki that leftists thought they knew began to unravel. At first a few FBI documents that were released seemed to show that Aoki was an FBI informant; many on the left were reluctant to believe it at first. Then more and more FBI documents were released that made that fact harder to deny. Leonard and Gallagher cite many documents in concluding that Aoki was in fact an FBI informant and that his identity as a revolutionary activist over decades was all a lie. Leonard and Gallagher cite the case of Aoki to make the point that many on the left underestimate the FBI’s technique of using informants against leftist movements. In going through the above examples and others, A Threat of the First Magnitude asserts that the left needs to do better at identifying and countering state repression, particularly informants. They assert that while leftists of the 1970s New Communist Movement were generally very aware that the FBI and other government agencies were spying on them, they still generally underestimated how informants intentionally seized on contradictions in the movement to try to prevent the movement from uniting or advancing. Revolutionaries aim to build parties and mass organizations and movements that can challenge capitalism for power and build a new, socialist society. To do this requires constantly bringing new people into political activity, since it is ultimately the masses of working people in their millions that make history, not small groups. But this necessary openness also gives an opening to the FBI and other government agencies to infiltrate left movements and organizations. This is an unavoidable contradiction. The way communist movements have tended to deal with that is three-fold. First, while maintaining broad and open mass organizations, Marxist-Leninists build a tighter, ideologically unified organization at the movement’s core that can maintain a solid and coherent political line and can also vet members before joining to keep as many infiltrators and others who may cause problems out of the core of the movement as possible. Second, Marxist-Leninist organizations practice democratic centralism, which means that all members have to carry out the line and activities of the organization and only express disagreements internally. This puts limits on the amount of disunity an infiltrator can cause, since to publicly advocate against the group’s line would be easily identified as a violation of the rules of the organization. And third, understanding the inevitability of government infiltration despite the best countermeasures, compartmentalization of information, only sharing sensitive information on a need-to-know basis, and refusing to engage in idle gossip about organizations, movements and individuals is another line of defense against informants. Such an approach aims to prevent infiltrators from getting information that could harm more than a small area of an organization’s work since an infiltrator would not be able to access information beyond what’s needed for their assigned tasks. Having said that, both the RU and the CPUSA were democratic centralist, Marxist-Leninist organizations that were still infiltrated up to the highest levels in ways that ultimately caused harm. While it may be impossible for a revolutionary movement to stop government infiltration entirely, it is important for the movement to work to minimize the impact by always keeping politics in command, and by raising the political understanding of those involved about the dangers of informants, some of their frequently used methods, and signs to watch for that something may not be quite right. Many of the examples cited in the book show that the government aims to create and fan the flames of disagreements on the left. This shows the importance of being very cautious about publicly attacking other individuals and organizations and giving the government an opening to opportunistically latch onto legitimate disagreements and make them more antagonistic. Recent efforts such as the ‘Saint Paul Principles’ developed among various groups protesting the 2008 Republican National Convention are important in upholding the principle of groups mutually agreeing not to criticize each other in public, and instead to work to resolve any differences face-to-face. This can render many FBI tactics unworkable, such as those aimed at stoking conflict through spreading misinformation and public criticism. While acknowledging the seriousness of the state’s efforts at repression, we need to also remember that the state is not all-powerful. While the FBI heavily infiltrated the CPUSA, that didn’t stop the party from growing to thousands and organizing some of the most consequential struggles of the 20th century. Similarly, with the RU: despite infiltration from the beginning, the RU was still able to cohere a national organization and grow into the largest group of the New Communist Movement that the FBI considered a ‘threat of the first magnitude’. That ultimately didn’t last, but it shows it’s not impossible to defeat the state’s goal of dividing and neutralizing credible left organizations and movements. A Threat of the First Magnitude begins with a discussion of Roman Malinovsky, an infiltrator who made his way into the top leadership of the Bolsheviks in the years before the 1917 Russian revolution. He did serious damage, including bearing direct responsibility for the jailing of prominent Russian revolutionary leaders. Until opening the state’s archives after the February 1917 revolution, leaders such as Lenin vehemently denied accusations that Malinovsky was an infiltrator. But even with an infiltrator as part of their leadership, the Bolsheviks were still able to lead a revolution, then consolidate power and build socialism for seven decades, defeating the Nazis along the way to turning the most backward part of Europe into one of the most powerful nations on earth. That example from 100 years ago on the other side of the world shouldn’t serve as an excuse to say the left in the U.S. today doesn’t need to learn more and do more to lessen the effectiveness of state repression. On the contrary; publicly acknowledging and exposing repression rather than hiding in fear or sweeping it under the rug when it happens is the first necessary step to counteracting state efforts that depend on secrecy and depend on isolating and intimidating people to be effective. 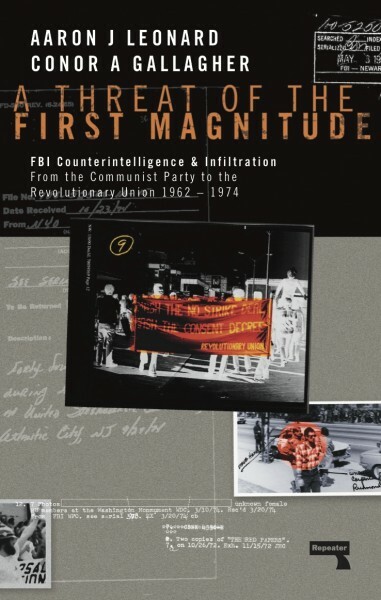 A Threat of the First Magnitude is an important book in shining a light on government repression and specifically the role of informants against the left in the 1960s and 70s. Protest movements will inevitably face state repression; it is only through taking that fact seriously, better understanding it and publicly exposing the shadowy, undemocratic methods of state repression that the left has a chance to advance despite those obstacles toward greater victories.